THE DIRTY ARMY: Nik, last night my baby daddy went to this chick’s party with his friend. He’s been there before and I’ve messaged her before when I was pregnant and found pics of her on his phone. 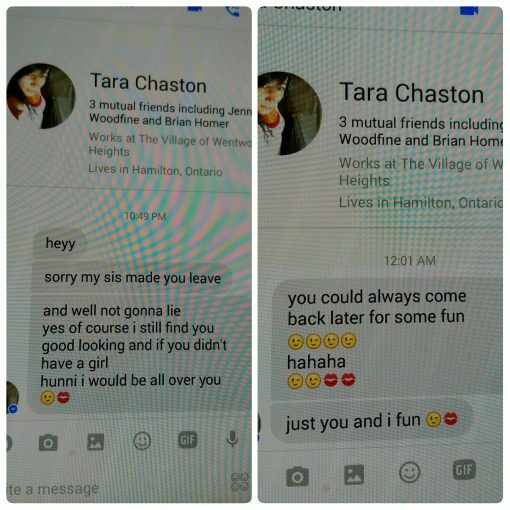 Tara Chaston seemed like a decent person, not interested in my baby daddy. The pics were innocent. So last night my baby daddy tells me he’s thinking of going to her party. He’d been drinking all day and I’d advised not to cuz I didn’t want him to end up passing out somewhere. He went anyway and I messaged her to find out info. She seemed like a decent person, said he was fine but then told me he was getting kicked out for being too drunk and picking fights. So then she decides to send him the first message to his Facebook. It was deleted after. I messaged her again asking if his friend went with him cuz I was worried about him. He wasn’t answering his phone and I was afraid he’d stop and pass out somewhere. She pretended like she cared but then sent him the second message. I was disgusted. Fully knowing this guy has a baby, a girlfriend but is totally drunk, and must have been desperate and lonely enough to try and lure him back. She has zero respect for other women and their relationships. She’s a homewrecking d-bag. I just want other women to be on the lookout because she’s not so innocent as she seems to be. She’ll go behind your back for a one night stand with your man.